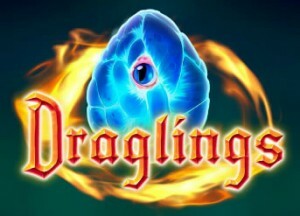 If you enjoy high-quality Vegas slots online, then you owe it to yourself to check out Draglings, which is available at SlotsClub.com as well as other online casinos that host Yggdrasil games. This slot game uses an unusual but very cool 3-4-5-4-3 configuration. That means that while the game has five spinning reels, there are only three rows in the first and fifth reels, four in the second and third and five in the center. 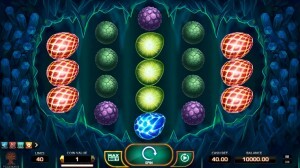 As with all Yggdrasil games, Draglings is available to play online without staking real money. Use that feature to sample the game before playing with real money or to play it like an arcade game. The game has 40 bet lines, and all of those lines are active by default. That means that if you choose a coin value of 0.05, the total bet per spin would be 2 coins. 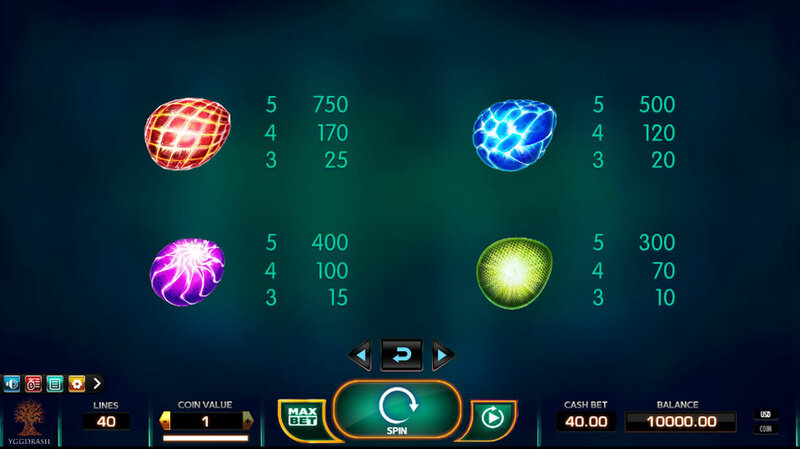 The coin value goes as low as 0.005 coins in order to cater to low-rollers, and the maximum bet per spin is 40 coins. Yggdrasil was founded by a former NetEnt executive, and that led some to believe that the games from these companies would be same-y. That hasn’t been the case at all. Both brands create games with amazing production values, but Yggdrasil delivers an art and game style that’s very much its own. The theme here centers on dragons, which the game calls draglings. The symbol set consists of dragling eggs, hatchlings, young dragons and one adult dragon that matures before your eyes whenever he appears. The only other symbol in the set is the free spin symbol. There are no poker symbols, and the small symbol set works well for the atmosphere but also for combo recognition. All of Draglings 40 bet lines win both ways, and if don’t have to pay more to activate that feature. What win both ways means is that a bet line can either pay out from left to right or from right to left, whichever is more valuable. 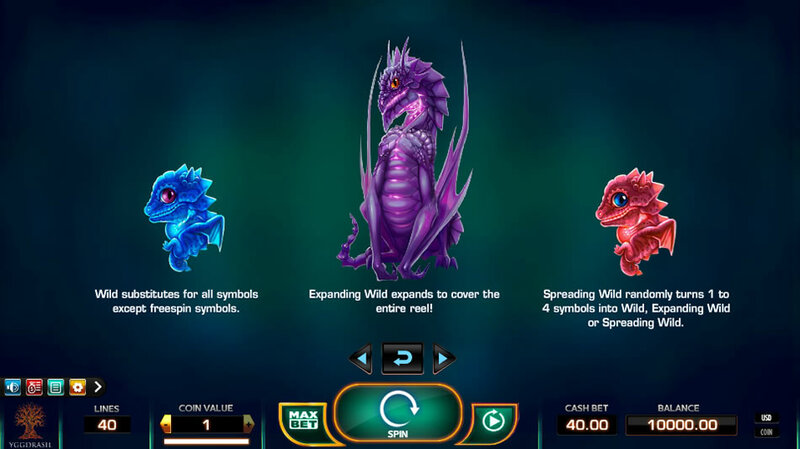 Another exciting aspect of this slot machine is that it offers three distinct wild symbols, and these can all substitute for any symbol other than the free spin symbol. The blue dragling is the standard wild symbol. The purple dragling is an expanding wild that covers the entire reel whenever it appears. The red dragling is a spreading wild that will randomly convert one to four non-special symbols into wild, expanding wild or spreading wild symbols. Spreading wilds can actually set off a chain reaction of spreading wilds if you get lucky. 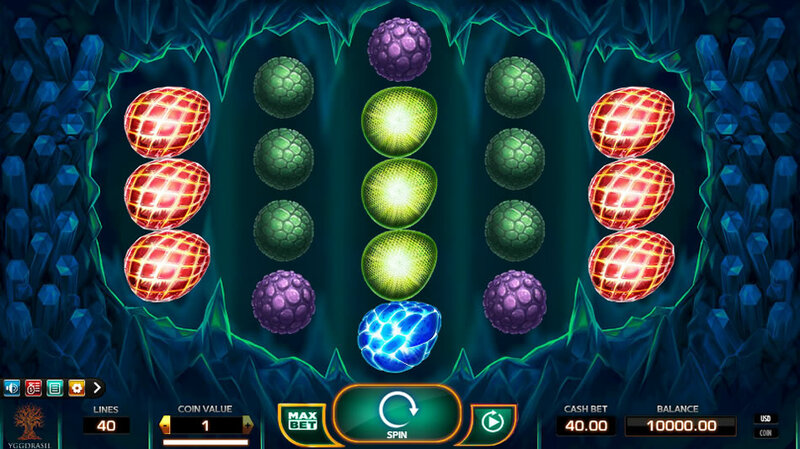 The free spin symbol awards two, 10, 20 or 75 free games when it appears anywhere on the reels two, three, four or five times. All wilds are active during free spins, and additional free spins can be accumulated during free rounds. 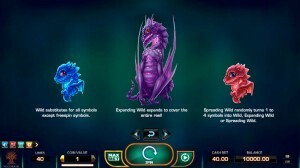 Yggdrasil set out to make free online slots that were unlike anything else on the market, and they really hit a home run with Draglings. 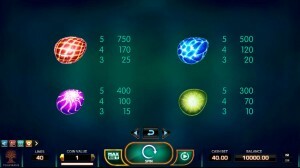 The game features a unique style, beautiful graphics and fantastic sound, and the gameplay is stellar and player-friendly. A feature like “win both ways,” which normally requires the player to hit a betting milestone, is included here at no additional cost. Likewise, games that have multiple wilds often add caveats, but that’s not the case here. All of the wild symbols work interchangeably and exactly how you’d expect them to. This is a fantastic option for high-rollers, but low-rollers can also participate for as little as $0.20 per spin. Draglings is a must-play, and if you’re a slot fan that hasn’t tried this one yet, make it a priority.